Thank you to everyone that came to the Competition Launch on Wednesday, February 27, 2019! The LifeBetweenUmbrellas.ca website is live – Please check this site for competition details. Vancouver is a rainy city. Located in a coastal rain forest region, the city sees over 160 rainy days a year, a condition that results in approximately 1,150mm of precipitation annually – with much of it falling between October and March. While the City has many excellent public spaces, most of these spaces are ill-equipped to support public activity in the rain. Public life in Vancouver is challenged by the weather. Utilization of parks and plazas drops, and otherwise vibrant streets and spaces lose opportunities for lingering and enjoyment. The umbrella overhead becomes a shield against the elements, and street life takes on an accelerated pace as people hurry to get out of the rain. 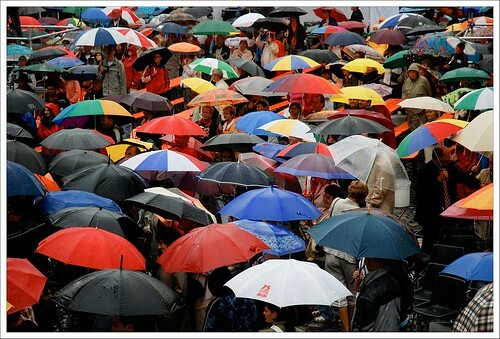 Life between umbrellas means the action in our public space either shuts down or shifts inside. Our public spaces – and the people of the city – deserve better than this. Umbrellas. Photo by solidther. Creative Commons. Starting in Spring 2019, the Vancouver Public Space Network (VPSN) and Viva Vancouver will hold a “design ideas” competition that encourages ideas on ways to improve public space and public life during Vancouver’s rainy months. 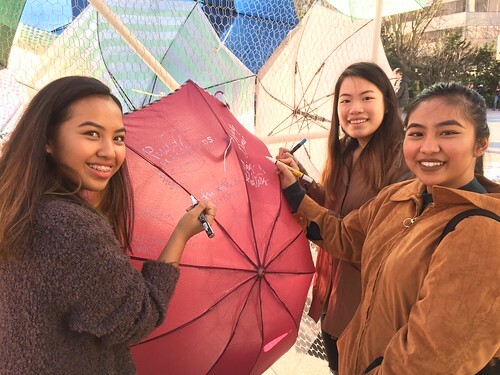 The initiative is called Life Between Umbrellas, and it aims to respond to the many challenges and opportunities associated with the wet-weather months by encouraging the generation of ideas for rain-friendly public spaces. 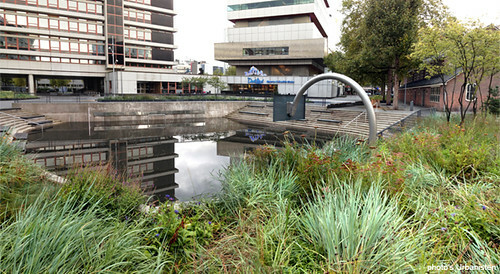 Other cities have worked to create rain-friendly public spaces. What should we do in Vancouver? Photo: Benthemplein, Rotterdam. Design and image by De Urbanisten. The Celebration: A rain-friendly activation/celebration – that can be delivered in 2019, and that can help to build a more positive culture of rain-friendly activity, creating fun during the rainy-months. The competition is intended to be open to a broad audience, including professionals, students, and the general public. Prizes will be awarded in each stream, and winners will be chosen by both a jury selection process and a people’s choice voting process. There will also be an array of supplemental events and activities taking place during the competition period, including speaking events, public space activations, and other fun stuff. Sharpen your pencils: the competition is open to everyone! What’s your idea for a rain-friendly public space? The Life Between Umbrellas will be launching towards the end of February – with materials, website and promotions available over the next couple of weeks. Stay tuned for more details, and start your thinking about ways to make your favourite public spaces more rain-friendly. Be sure to follow us on social media for the latest updates, hot off the press. You can also send any questions you might have to the competition steering committee.